Day after day, he worked to perfect the love potion to seduce this untouchable woman. He asked her to meet him early in the morning in the park where the cherry blossoms were in full bloom. The perfect moment to kiss her would be apparent. Later, he understood that she never drank the filter he prepared. Instead, it was destiny that brought them together. Philtre Ceylan (roughly translated as Ceylon love potion) is part of the Collection Orient. Philtre Ceylan's mix of notes1 promised an exciting perfume experience; it opens with the scents of strong black tea infused with citrus and spearmint. What happens next is surprising and interesting: a competition between great tea notes and cumin; it's as if the cologne were breathing on your skin, one exhale smells of tea, the next of cumin...back and forth...on and on. And cumin and tea are a great combo. Do you think I hate Philtre Ceylan? Not at all! I love "robust" fragrances. Several scenarios came to my mind while wearing a good dose of Philtre Ceylan on my skin: 1. I had forgotten to wear deodorant on a super- hot and humid day; 2. I tried to cover up my sweat with tea-scented perfume; or 3. I was wearing a shirt that needed laundering. Still, I enjoyed wearing Philtre Ceylan...even as I was (a bit) wary about the impression I was having on those near me. (One woman at work wrinkled her nose when I came to her desk but I could see from her expression she immediately thought better of saying anything to me: "Is it Kevin's perfume...or...?" The only durable notes besides tea and cumin that catch my attention in Philtre Ceylan are dry papyrus (almost smoky) and an "overall aroma" that reminds me of my FAMOUS (just ask Robin here at NST!) lime pickle preserve (which contains quite a few Indian spices and mustard oil). If you love spice and tea (and perfume-y B.O. ), give Philtre Ceylan a sniff; it has great projection and, for an Atelier Cologne fragrance, good (half-day) tenacity. 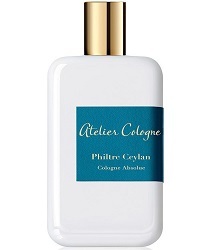 Atelier Cologne Philtre Ceylan (Cologne Absolue concentrated at 20%) is $325 for 200 ml and $250 for 100 ml (as of today, I see no 30 ml option for separate purchase); for buying information see the listing for Atelier Cologne under Perfume Houses. Note: top image is detail from Govardhan. 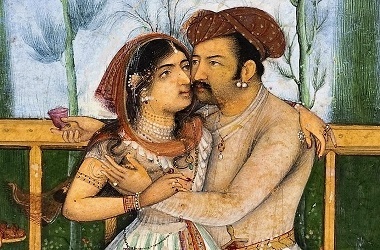 Dalliance on a Terrace via Wikimedia Commons. 1. Listed notes of bergamot, spearmint, cardamom, black tea, green tea, iris, cumin, gaiac wood, papyrus. Nope. Just nope for me. But I read your pleasure with enjoyment! Oakland, I’m sure many will agree with you! I’m a huge AC fan. In fact, there isn’t one I dislike. So I’ll reserve judgment until I sniff it. But bottled BO? Slightly gagging right now. ???? Laura, do give it a try, perhaps not on skin…. I love the Atelier offerings…have several full bottles (including the HUGE 6.8 oz of Orange Sanguine which is halfway drained) and every sample of the line except for the Collection Orient…..however, I saw the word “cumin”…while I love to eat it, it just doesn’t work for me in perfume….I am glad that you are enjoying it though! I tried this one at Neiman Marcus, and I think tea and cumin is not the combo for me. I am not anti-cumin, but I tend to prefer it combined with florals or sweeter notes. I didn’t hate this one though.. I kind of went back and forth between being fascinated and repelled. Sweetgrass, fascinated and repelled, which begs the question: why aren’t there any durian perfumes? Ha! I had durian ice cream once. And only once. Elisa, I guess those who wore a durian fragrance would be banned from public transport!? YES! I have been places where the Durian fruit are forbidden on public buses and such. I am trying to remember where. It might have been Singapore. Oh please. Now you have gone to far!!!! Durian perfume… tsk tsk tsk… next you’ll be asking for cadaver hair mist and lutefisk scented candles…. OF…I’ve smelled cadaver perfume…but won’t mention the name because it’s a small company! Well there is always Eau de Cay with its notes of blooming corpse flower! Huh… I hadn’t thought about that.. A perfume with a durian note could be a different twist on a fruity floral, eh? Durian smells a bit like a gas leak to me, at least from a distance. I realized it was durian season once while shopping in an Asian market because I thought I smelled gas but looked around and saw that it was just a huge bin of durians a little ways away from me. Thank you for the amazing review, Kevin. I don’t usually like AC but I will definitely be seeking this out. Sidebar, I blind purchased one of the Juniper Ridge Backpacker Colognes based on your review, and you nailed the scent dead on. To me it wears like an after gym sweat aroma on some workout addict, balsam, and a tinge of unwashed body. I love dark and quirky, but his made me wince more than once at myself during the initial first hour. I’ll smell the AC too and for whatever reason add it to my collection if the store in Nolita has a 30ml size. Lindeberg, hope the 30 ml shows up on its own…so far, it just seems to be available in a set. Sounds like the male version of Alexander McQueen’s “Kingdom”! …which would mean I need the 200ML. Guess I will have to seek out a tester. I worked with a man who smelled so wonderful that I didn’t mind working with him (he was loud and abrasive but not without charm.) Later, I tried MKK and it was his exact smell! I bought that export bottle and promptly used half of it in a hurry. Did I mention he made the BEST pound cake? The best. I had to order two for my birthday: one public and one private. I’d love to try this, but it would be hard to outdo Eau d’Hermes. Coumarin, I think this outdoes the Hermes, not as smooth. Want to chime in to verify that Kevin makes really incredible lime pickle. We might need to interrupt regular scheduled programming for a post about these. I’m addicted to lime pickles. Coumarin, if I made my recipe public I could no longer bribe Robin!!! I tried something recently with a suggestion of cumin that I liked. It might have been Nishane Musiqa Oud, but I’m not sure. I need to take notes. BTW, I’m loving Astier de Villatte’s Commune de Paris. It needs an EdP version, though. This is off topic except that you reviewed their Eau Chic. We do evolve, don’t we? Noz, I’ll be reviewing that next week! Viva, evolution! Que viva! Looking forward to next week! I feel exactly the same – rose anonym is the only one that made much of an impression on me. But this one sounds pretty interesting! littlecooling: my main problem with Atelier Cologne is the lasting power. Many DO concentrate on one great ingredient…but they peter out. This one, not so much. And I think you are right..the price tag for the lasting power doesn’t match. If they were powerhouse fragrances, perhaps I wouldn’t mind spending big bucks. While I enjoy sniffing their fragrances, so far the only with any lasting power on me & I sprang for a FB was Figiuer Ardent. I recently bought a rollerball of Bergamote Soleil as a blind buy since it smelled good in the bottle, but I can’t smell it on me at all. It disappeared somewhere between first spritz & the time it took me to bring my wrist towards my nose. The same thing happened with Cédrat Enivrant (and I so loved the smell of it in the bottle), but it faded away almost immediately too. VG…those two fade fast. I did buy Trefle Pur and Vanille Insensee and they last a good while, as does Philtre Ceylan…it’s hit or miss. Have any of you tried AC’s scented candles? I love spice and tea and I’m actually not opposed to some perfumey BO, so I’d like to try this one. But 200 ml of it? I think a 2 ml sample will do just fine. Aparatchick: the samples are nice…2 ml, postcard included. Agree – the samples are a must try for me, before I can commit to the price tag of purchasing a bottle. I think with the samples only being $3 each – you could sample all 5 scents in collection for only $15–or get the “Best of” sample collection for $30 which includes all 5 of the Collection Oriental fragrances + some others and also get a refund of your $30 to apply towards the purchase of a larger bottle. I tried this at Neimans (albeit at the end of a long day of sniffing, so maybe I wasn’t at my most perceptive), but I quite liked it, and I’m not even a cumin fan. I’m embarrassed for the PR, though. Eleebelle: well, do try it again with a “fresh” nose before buying! Cumin is not my cup if tea so I think that I’ll pass. ???? I enjoyed reading your review nonetheless. Thanks for the fun read, Kevin. This sounds like it might be right up my alley! I’ve only recently discovered that there are very few things that are too animalic for me, so I’m going to march bravely onwards! I haven’t even tried Muscs Koublai Khan or Eau d’Hermes, so I appreciate the mention of those as well. Holly…you have lots of great things to discover! I do! I hope you’ll try Romanza (a skanky narcissus) and Barbara Herman’s Eris line if you haven’t already. My favorite is Ma Bête, the skankiest of the three, apparently. Durian Perfume – absolutely brilliant!